Dancers, singers, acrobats, jugglers and comedians across Tipperary have been called on to audition for the next series of Britain’s Got Talent when it rolls into town later this year. The long running TV show is set to host open auditions in the Cathedral town this November as they search for the successor to the 2018 winner comedian Lee Ridley. The ultimate winner of the show will take home a £250,000 cash prize as well as a chance to perform at the Royal Variety Performance next year. 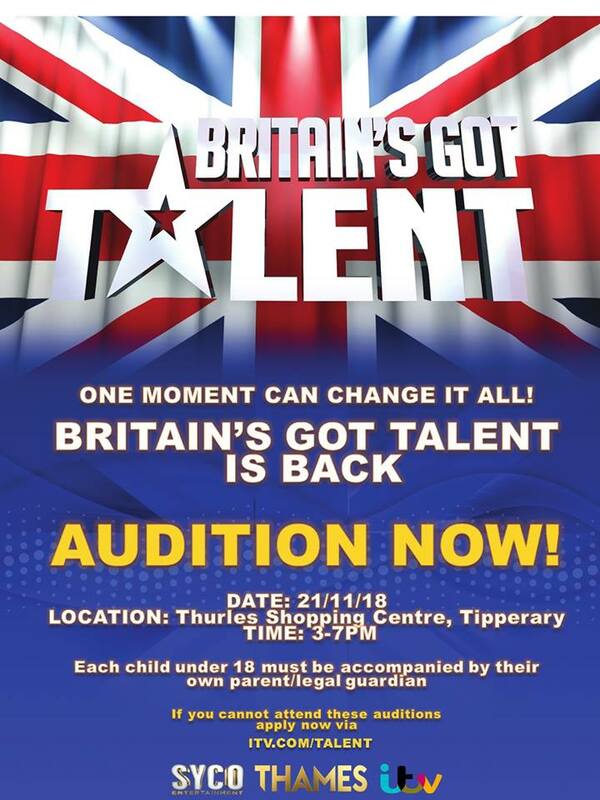 Auditions for the next series of Britain’s Got Talent take place at Thurles Shopping Centre on Wednesday 21st November from 3pm to 7pm. All children under 18 must be accompanied by a parent or legal guardian.